Tucked into the bush and a stone’s throw from the bay, Hardys Bay Club is a beautiful venue for a wedding or event. With ample space, indoors and out, we can comfortably accommodate functions of 30-120 in our relaxed, coastal setting. Whether it’s a summer wedding on the pergola by the waterfall or a birthday dinner in the Bistro, our friendly team will go the extra mile to ensure that your day is a unique, personal and enjoyable one. Chef Dane Walker comes from a background in fine dining and trained at some of Sydney’s premier restaurants. His highly qualified team will work with you to create a personalised menu for your event and can cater for all budgets, tastes and dietary requirements.Our primary function area is our bushside pergola area. This is a partially-covered outdoor space which consists of a pergola, decking and grassed area. The area comes furnished with picnic tables, hand-made fence-paling tables and chairs. We are happy to allow decorations, your own furniture, lighting and musicians to help make your event more personal (we also have fairy lights and several hand-made decorations that we’re happy to share). The area is fully powered, with heating and permanent festoon lighting across the grass and spot lighting into the bush. If you’re looking for a relaxed and personal function space, then this is a unique venue unlike any other on the Central Coast. 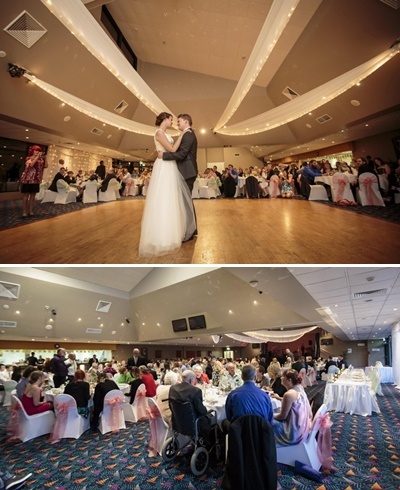 Overlooking the beautiful Brisbane Waters, Davistown RSL Club is a stunning venue for weddings and functions. The Club has function rooms to accommodate any type of function from 30 to over 300 people and offer a range of excellent menus. It can cater for different styles of functions including weddings, receptions, ceremonies, parties, anniversaries, meetings and seminars. The Grand Broadwater room holds up to 330 people and has a large dance floor with a big stage with optional cat walk. The Broadwater West room has a dance floor and stage and holds up to 160 people. The Broadwater East room holds 140 people. Our Chef’s will cater to suit your needs and we also have some value for money package deals. Your function is your special day and our staff will strive to provide the best possible service for you. At Davistown RSL there is no wedding too big or too small and our room hire is exceptional value. For any function inquires or to obtain a function pack please call the office on 02 4363 0199 or email us. Uniquely positioned where Terrigal meets the ocean, The Clan Terrigal is the only accommodation where you can walk out your door and onto the beach. The iconic Clan Terrigal consists of 32 guest rooms, 21 of which sit right on the lakefront and we are AAA 4 star rated. All rooms are fitted with air conditioning, TV, free Foxtel, telephone, wireless internet access, refrigerator, tea / coffee making facilities. The property has a range of double / twin share rooms and 6 family rooms. Our 21 waterfront rooms all have extensive views of the lake and beach through large glass sliding windows and doors. Ground floor waterfront rooms allow access directly on to Terrigal Beach with upstairs having individual balconies with views over the lake to the beach. Family rooms have a separate second bedroom with two single beds and will accommodate two adults and two children. We have a complimentary guest laundry and convenient on site car parking is provided for all rooms (one car parking space per room). Maccoa Restaurant, located at The Clan Terrigal, has fast become a favorite on the Central Coast dining landscape with it’s beautiful elegance and simplicity. The menu, created by group executive chef Melissa Dixon, features local seasonal produce, making for creative , beautifully presented, flavour filled food. Maccoa’s fresh white decor, with clever pops of colour, enhances a food experience like no other on the Central Coast and is quickly proving hugely popular with locals and beyond. Open for breakfast, lunch and dinner, Maccoa offers something for everyone including local nights and BYO wine, senior’s specials, Saturday Sips $10 cocktails, live music, and special menus for groups, functions and conferences. We can show you photographs of our unique waterfront position, but the only way you can experience the dedication with which we make your conference run smoothly and efficiently is by being here. Catering for up to 60 delegates, the Conference room is a purpose built venue with facilities including flipcharts, an electronic whiteboard, projector & screen, and a 106cm plasma wide-screen TV. Our exclusive executive lounge is the perfect location to relax and enjoy a pre-dinner social hour – including a billiard table and cosy lounges. With our absolute waterfront rooms and a friendly team of conference professionals to look after you, everything is in place for a successful conference. With Terrigal beach literally at our doorstep, there is plenty to do. Just dust off your surf gear and don’t forget your swimmers, sunnies and sunscreen.